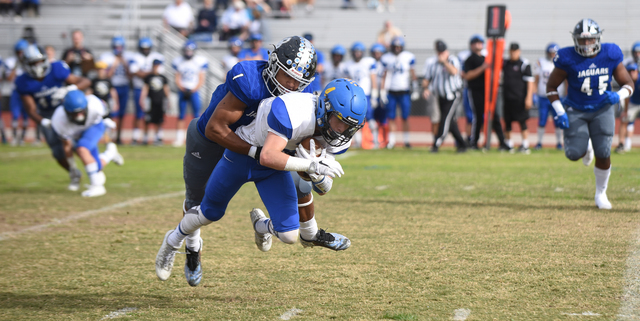 The Desert Pines defense, which hasn’t given up more than seven points in a game in more than a month, will look to continue its dominance Saturday when the Jaguars (11-1) face Spring Creek (11-0) in the Class 3A state title game at 1 p.m. at Bishop Gorman. 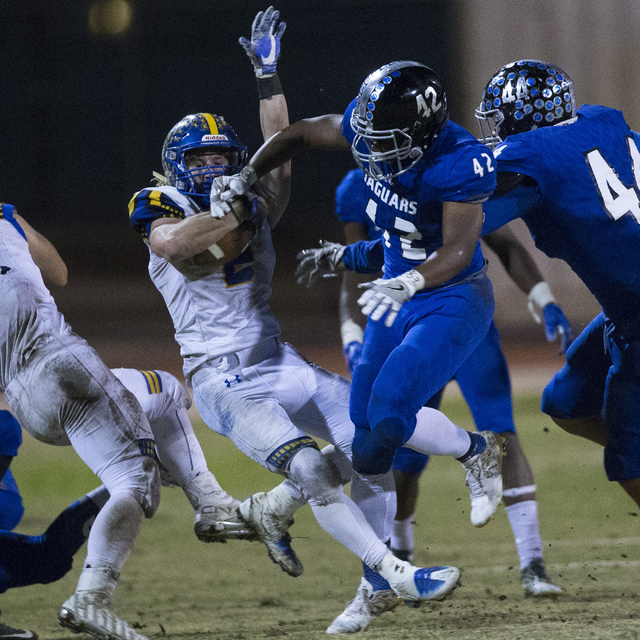 Desert Pines’ football team hasn’t had any problems lighting up the scoreboard this season. The Jaguars average 39.3 points and have scored more than 55 three times. But that’s not the reason the team feels confident entering its final game of the season. 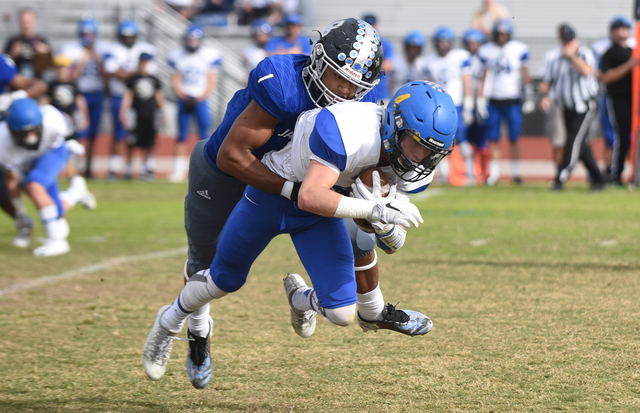 The defense, which hasn’t given up more than seven points in a game in more than a month, will look to continue its dominance Saturday when Desert Pines (11-1) faces Spring Creek (11-0) in the Class 3A state title game at 1 p.m. at Bishop Gorman. Rodriguez, who has been coaching at the school in some capacity since 2001, lauded his defense’s ability to learn complex schemes, carry them out in games and adjust on the fly. He didn’t mince words when he was asked where his defense ranks among the best he’s seen. 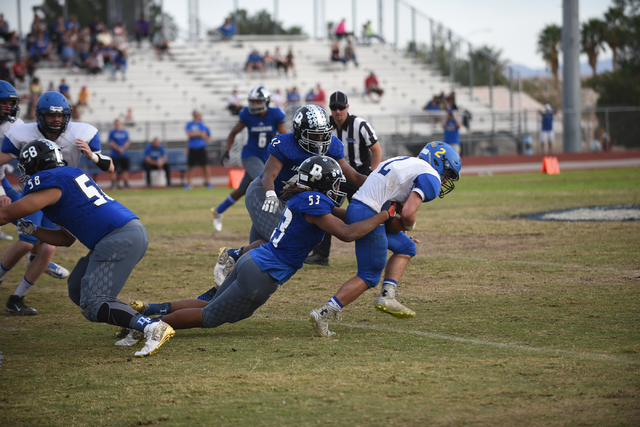 Desert Pines has allowed only 13.0 points per game this season. That stat, however, is somewhat misleading. 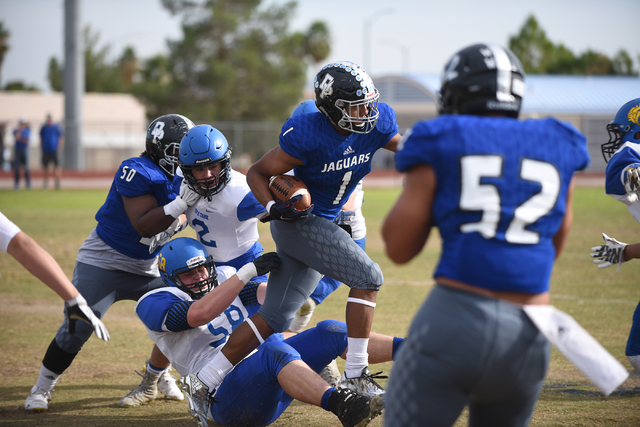 Outside of their games against Class 4A teams Centennial and Liberty, the Jaguars haven’t allowed an opponent to score more than 20 points in a game. Sunrise Mountain scored 20 against them on Oct. 14. Rodriguez said a lot of the credit belongs to second-year defensive coordinator Michael Cosgrove, a former Desert Pines player who returned to the program after having a brief stint with the Detroit Lions. Fields is the enforcer on the field. The 6-foot-2-inch, 205-pounder leads the Jaguars in tackles and has been the heart and soul of the team on both sides of the ball. But it doesn’t end there. 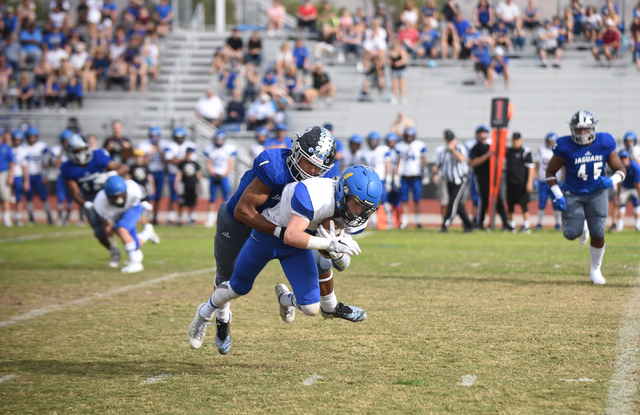 Senior linebacker Jautae Collins is among the team leaders in tackles for the third consecutive season, and Jalen Graves (14 sacks), Gabriel Lopez (seven sacks) and Eddie Heckard (four interceptions) also have produced. All have played a key role in shaping a defense that has allowed a total of 27 points in the past four games. Fields knows it will take more of the same for the Jaguars to win their first state title.